JP Accelerator Works, Inc. offers years of experience in software and hardware development of controls for complex systems such as linear accelerators and pulse-power systems, data acquisition in difficult environments and sophisticated data analysis. JPAWs state-of-the-art control system features distributed intelligence, high reliability, and simple connectivity. JPAW's state-of-the-art control system features distributed intelligence, high reliability and simple connectivity. See our close affiliate, VI Control Systems, for more information. JPAW associate, VI Controls, has developed LabVIEW software for a high energy pulse power simulator to control and monitor over 2,000 I/O points. This systems uses a combination of ControlNet, National Instruments I/O boards, and GPIB-based instruments. VI Controls is a National Instruments Alliance member (Certified Consultant). JPAW has developed LabVIEW applications that perform distributed data collection and control over networked computers and the Internet. JPAW associate, VI Controls, has extensive experience developing custom driver level software for commercial instruments and micro-controllers using GPIB, and RS-232, interfaces. We have application experience with National Instruments GPIB boards, DAQ boards, digital I/O boards, timing I/O boards, and SCXI hardware. 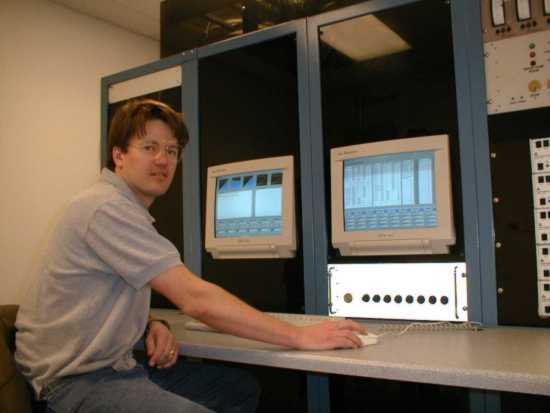 JPAW has 30 years experience with small signal acquisition, in noisy environments. We can provide custom analog, and digital, fiber optic transmission systems to meet your data transmission requirements. We can also provide EMI/RFI chassis and boxes with custom electronic circuit designs to meet your control and data acquisition requirements. Neal Pedreson, of VI Controls, at the LINAC control console. Photo courtesy of International Isotopes, Inc.
©1999 - 2006 JP Accelerator Works, Inc.